Often at this juncture – as weeks turns to days and then hours ahead of a Carrow Road derby – I’ll find an excuse to write a piece that is little more than a thinly veiled call to arms. I’d trot out the usual lines and clichés around the opportunity that awaits, which “simply has to be grasped because it may not come along again anytime soon”, and probably chuck in a ‘carpe diem’ at the end. I don’t suppose for one second it registers with anyone, but there’s definitely a cathartic element to it and if no-one else is fired up when those blue shirts clash with the green of the Carrow Road pitch, then at least I am. But this derby feels different. Is different. 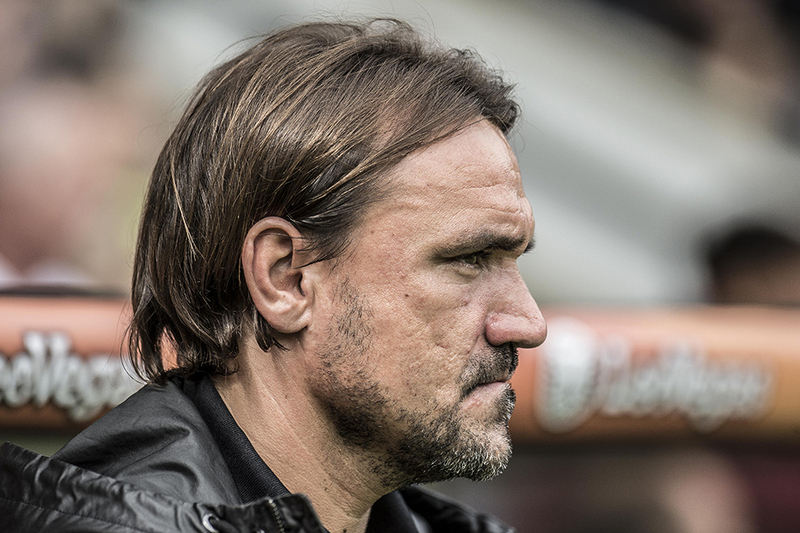 There is no need for talk of fire and brimstone, nothing to be gained by tub-thumping and certainly no need for Daniel Farke – accompanied by stirring background music – to recite Kipling in the moments before the players depart the dressing room. In fact, the more Farke’s men are able to treat it as just another league game, the better. What we actually need is for this week to be a week like any other, where the Colney routine differs not one jot from the one that has served them so well for the last six months. Tim Krul has already spoken of the intensity on display in the final training session before departing for Yorkshire – so another week like that will do nicely. We can guarantee Stuart Webber and Team Farke will be doing everything they can to ensure this is precisely the case. A local derby naturally demands nerve, cool heads and, when the situation demands, for tackles to be unflinchingly made. In other words, the exact same qualities displayed by Messrs Trybull, Vrancic and twelve of their mates in the white-hot cauldron of Elland Road last Saturday night. Nothing that 2000+ from that “little corner of Norwich that will be forever Ipswich” can throw at them will come close to 35,000 spitting, seething Yorkshiremen collectively telling them to go forth and multiply. Every game is different of course, every event is different, and Elland Road on Saturday night was an occasion like no other, but despite Sunday being one of those twice-annual events that stirs emotions that lay dormant for 50 weeks of the year, the same mindset and application is most definitely the order of the day. No extra venom is required, no need for the veins in the neck to be bulging and certainly no need to for raw meat to form part of their pre-match meal. In the same way that being hyped and wide-eyed did Los Blancos no good whatsoever, Carrow Road on Sunday, while no place for faint hearts, will be a place for clear heads. ‘More of the same’ should, and no doubt will, be the message from Farke with there being nothing to be gained by the players getting wrapped up in the emotion a local derby naturally evokes. Paul Lambert, on the other hand, and as described beautifully by Mick in his piece this week, will want quite the opposite. He wants it to be an occasion every bit as venomous and bristling as those previous two East Anglian derbies he was involved in. He wants it to be an afternoon over and beyond the norm at Carrow Road, where the venom and ire are directed at him and, in turn, deflected away from his players. And, of course, there is the small matter of him positively itching to be given the treatment by the City faithful when he deliberately and provocatively goes out of his way to connect with said little blue corner. Expect fist pumps with maybe a thumping of the heart thrown in for good measure. Quite whether those who see the crossing of the hard border, albeit via a tour of the country, as a heinous crime will be able to contain their wrath is debatable, but if there is one thing that would get under Mr Lambert’s skin it’s for him to be met with indifference. But, infinitely more important than who is sitting in the opposition dugout and how he interacts with his new fan club, is our chosen XI in yellow going about their business as they have done successfully all season. We do that, we avoid it becoming ‘a war’, we make it a football match and we win the match. Don’t we? There is one thing that could throw a spanner in the works, and that’s the intervention of those little buggers sometimes referred to as the footballing gods – and I’ll be honest… I don’t trust them – but all we can do is trust Daniel and his men to deliver as they have done all season. Not once have they let us down, even when we’ve lost the game, and I don’t see that starting on Sunday. For our part, we can make sure Carrow Road is bouncing… and not to Lambert’s tune, to Farke’s. If you haven’t yet seen our Connor’s full interview with Stuart Webber, I’d thoroughly recommend it. It’s here on our new YouTube channel or here in audio form. I see this as a good opportunity to improve our GD, plus they’re overdue a good thrashing from us. With the same application and concentration as last week, we’ll be fine in this game. The preparation will have been thorough, with no need for rousing talk about the derby (the players will have received plenty of that as they go shopping or dining in the city). A key three points for Norwich City are at stake. We can do our bit by cheering on the team, and not firing up the opposition. Great read as always Gary, I couldn’t tell you why but I am more nervous than usual about this game! It’s not just a derby match, it’s also the return of a former favourite manager who’s stock has sunk without trace since leaving us for greener pastures, or so he thought. Add to that, they are bottom and we are top and I can see banana skin written all over this! Please tell me I have nothing to fear! Please! Pretty please!!!! And as you, Mick D, myself and several others have said: as far as Lambert is concerned, let indifference be the key. To paraphrase The Jam from The Gift: Oh baby I’m dreaming of Sunday. I’m actively very much looking forward to it – just like the rest of us, I’m sure. There’ll be plenty of hollering and hooting from us in the UB and I doubt the boys downstairs and our friends in the Snakepit will be quiet either. Yes you’re right of course Graeme. Mea culpa. Comment in haste, repent at leisure. Nothing will ever beat Setting Sons for me. The Weller take on Martha Reeves’ “Heatwave” still sets my soul on fire 40 years on. Along with the Clash the Jam were the only band of that era who could sustain a full album. I loved both equally. Come on Martin! I’ve got a stash of albums from that era! Golden stuff, all of it. Music stopped in the mid eighties as far as I’m concerned. Wot about the Manics, Mastodon, Oasis and Uncle Acid and the Deadbeats then? As much as I loved singles from the late 1970s-early 1980s (Banshees, Only Ones, Damned, Undertones, Buzzcocks. even the Pet Shop Boys) I couldn’t listen to an album from any of those bands..
Maybe Plastic Letters or Parallel Lines by Blondie who produced deliciously pure pop with an edge and had an incredible drummer in Clem Burke.. Lets keep PL in his own Private Hell !! Hey Graeme – I thought I was supposed to be the pedant in this family! Like everyone a low key reception for PL would be a good game plan and could take the sting out of any possible trouble that a few idiots might decide to cause. As for Sunday it will be a nervy game them not want to lose and city not wanting to concede an early goal I would like a similar game to last week posdibly a 1 nil lead at half time then pounce in the second half. I agree, it would be good if we don’t get drawn into Lamberts little games. However, they are Ipswich town and should be made to feel as unwelcome as possible. For those of us of a certain vintage, the ugly mug ball that was mariner, mills, Brazil, muhren et al springs to mind on derby day and the need to see them beaten is as strong as ever. Not for me this wave of sympathy for their plight, or the bizarre hope,that they somehow survive their current predicament. Recall the joy at our demise a few seasons ago, the planned plane flying a mocking banner, the aborted “relegation celebration party” planned for Prince of Wales road of all places, the bile that seeps out from the Twitter pages. I want them down, like the law – they should be done and they should be seen to be done. I’m sure herr Farke and the boys are well aware of the importance of this fixture and given their willingness to please will not be sidetracked by Lamberts nonsense. His new fan club may lap up his every word, after all, he’s trebled their win column! We shouldn’t fall into his trap. I prefer reading Gary’s columns to reading Shakespeare,Keats,or Viz. Truth and beauty with the pen. I look forward to the next honest and spoken from the heart and brain post. Congratulations from France. Probably time for a bit of squad rotation. Play two up front, Klose and Hanley! Last time we got promoted, someone put a new road sign at Hempnal crossroads on the A140, one arm pointing north saying “Premiership”, the other pointing south saying “Championship”. I hope see it re-appear later this spring with the southern arm amended to “League 1”.